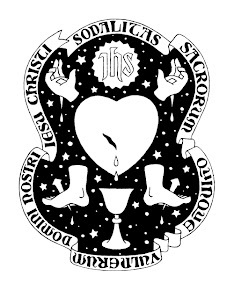 On Wednesday 5 May the Sodality of the Five Holy Wounds of Our Lord Jesus Christ had its fourth meeting with the newly printed booklet of prayers for the exercises (meetings of the sodality). After a certain amount of revision from the original order of prayers in the following two meetings (March and April) Matthew and I have, with the permission of of the Spiritual Director, Fr. Andrew Southwell, finally come up with (we hope) a more or less defined (if not yet definitive) set of prayers. 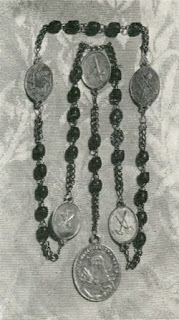 Instead of praying the Rosary (a devotion we still encourage for daily recital) the Sodality will now pray the Chaplet of the Five Holy Wounds (see the Passionist Historical Archives website for an article on the Chaplet and how to pray it: http://www.cpprovince.org/archives/thepassionist/chaplet-5wounds.php ). My own feeling was that these changes were well received by those who attended the meeting, and their most conspicuous result is to focus the particular charism and spirituality of the Sodality, which is dedicated most especially to Our Lord's Passion, and to a spirit of mortification and self-detachment, both of which are necessary for the earnest practice of mental prayer, which it is one of the Sodality's chief aims to inculcate in its members. Fr. Southwell spoke about the importance of devotion to Our Lady for our interior lives, and her special role as she through whom God has decided from all eternity that all Graces are to be distributed. Father demonstrated these points through a meditation on the different stages of Our Lady's life, and the inextricable bonds she has with her son, Our Lord Jesus Christ. In the conversation that followed the exercises a lively debate took place about the various ways that Mary has been misunderstood by the world, but also by Catholics, and Father advocated devotion to the Rosary as a sure remedy in our own lives for such confusions and misunderstandings. We will hope to get some physical chaplets for the next meeting, and I will be writing another post shortly on where to buy Chaplets of the Five Holy Wounds and where to have bespoke chaplets and rosaries made. Thanks for writing this - useful summary for me as I was unable to attend the meeting. I'm sure you are aware but the next meeting bit needs to be updated. Thanks.